IN CELEBRATION of Fountain Pen Day—marked globally every first Friday of November—Manila’s foremost dealers of pens and inks will set up shop on November 5 and 6 at SM Aura Premier in Bonifacio Global City near Toby’s Estate on the 3rd floor. Scribe Writing Essentials, Pen Grafik, Everything Calligraphy, Faber Castell, National Book Store, and Lamy will be showcasing some of the finest brands of pens and inks from Europe, the United States, and Asia. Fountain Pen Day was started in 2012 by American pen collector Cary Yeager. In the Philippines, the Fountain Pen Network-Philippines (www.fpn-p.org) organizes this festival. With over 2,000 members in its Facebook group, FPN-P is a diverse community bound by a shared love for the written word in an increasingly digital age. Its members include writers, lawyers, doctors, teachers, artists, tech professionals, civil servants, and students. Fountain Pen Day Philippines 2016 is also made possible by the support of SM Aura Premier, PNB Savings Bank and Asia Brewery. For more updates on Fountain Pen Day, go to Instagram and follow @fountainpenday and @fpnph, or interact using hashtag #fpdph2016. IT’S BEEN a while since I’ve written about my favorite pastime (aside from my weekly poker binges and my foot-massage-and-movie dates with Beng), so indulge me this break from the headaches of literature and politics and let me talk about those obscure objects of my writerly desire—pens and all things appurtenant thereto, as my lawyer friends would say. 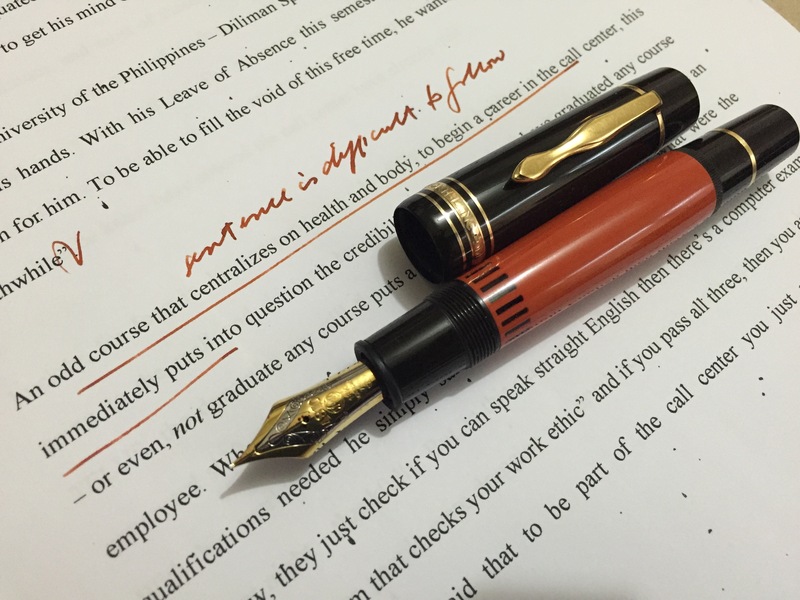 We have, not incidentally, a good many lawyers among our members at the Fountain Pen Network-Philippines (FPN-P), which isn’t surprising, given how lawyers have traditionally used pens in their work, and at least in taking their bar examinations. Those pen-wielding members of the Philippine bar include Undersecretaries Albert Muyot, Ronnie Geron, and Rey Cruz; SEC Chairperson Tess Herbosa and SEC lawyer Joanne Ranada; pro-gun advocate Ticky Tabujara; former ACCRA lawyer Elsa Divinagracia; and Aboitiz lawyer Anthony Goquingco. While he hasn’t formally signed up with FPN-P, Supreme Court Justice Marvic Leonen, an avid pen user, has turned up at a meeting or two. We also have a sizeable representation of doctors—among others, Novartis executive Aileeen Dualan, surgeons Jojo Hosaka, Joy Grace Jerusalem, and Leo Ona III, Healthway Medical head Eleanor Bengco-Tan, barrio doctors Edrie Alcanzare and Jim Lopez, Dagupan-based rehab specialist Hazel Gazmen, company physician Kristine Arabaca, and new Med graduate Mark del Rosario. Predictably, there’s a special thread in our forum devoted to providing specimens of our doctors’ handwriting—the more unreadable, the more impressive. Alongside these professionals come teachers, writers, artists, businessmen, bankers, students, and all manner of writing enthusiast, drawn to the group if not by pens then by inks, papers, calligraphy, or drawing. What started out in my front yard in Diliman seven years ago with less than 20 people has grown to over 500 members on our dedicated website at http://www.fpn-p.org/, and more than 2,000 on our Facebook page (being FB-averse, I stay out of that group, but you’re welcome to sign up there if FB’s your thing). Once or twice a month, we get together—typically for a long Saturday lunch in a Makati or Ortigas restaurant—to play with our pens and to doodle away in wild abandon. While we may talk politics in the corners of the meeting and devote some attention to tangential interests like watches and knives (you’d be surprised how many pen people have one or the other or even both as secondary hobbies), the focus is clearly on fountain pens, inks, and papers. Whatever for? There’s no better way I can explain it than group therapy. As I’ve said in this column many times, it’s the sheer tactile pleasure of laying down lines and letters on a page, of watching the ink spread through the paper’s fibers, creating networks of meaning, or otherwise an impression of beauty, an entirely handmade beauty at that. This is what you can’t get from a ballpoint or a rollerball—a soft or shaped nib that can create breathtaking line variations from from extra-fine to triple-broad, that can be so sensitive to the touch that the merest tremor can betray some deep-seated emotion. With every stroke of the pen, another worldly care is banished, another rampant anxiety quelled. There’s nothing more intimate yet more revealing than that stroke, the physical commitment of thought to paper. Fountain pen collectors (among other creatures infected by the same virus of compulsive acquisition) often speak of their “grail” pen, that one elusive, near-unattainable pen that calls to them in their dreams and shimmers like a mirage on the horizon of their consciousness. That pen could be as simple as a Parker 51 that they recall their father used, or as weighty as the Montblanc 149 favored by Supreme Court Justices, or as uncommon as a custom-made Nakaya or Hakase epitomizing the finest of Japanese craftsmanship. Over the past 30 years of immersing myself in the hobby, I’ve had many such “grail” pens cross my fevered brain, and have actually had the good fortune of realizing most of them—a 1938 Parker Vacumatic Oversize in burgundy, a Parker “Big Red” Duofold from 1926, a Montblanc Agatha Christie from 1993, and, most recently, a Montblanc Ernest Hemingway from 1992. Almost as interesting as the pens themselves, each of these pens has a story behind it, a near-mythical chase across decades and continents. Unlike many collectors, I don’t keep my best pens in a case, under lock and key. I rotate them for daily use, praying that I’ll never lose one, although that’s almost a statistical certainty. It isn’t ostentation that impels me to do this, but rather an acute and growing awareness of time passing—of the sense that, at my age, I probably have another ten good years left, and what a waste they would be if I let my happiest acquisitions moulder away in some dark drawer, never having kissed paper. Open to the general public, the day’s events will include a pen-and-ink art exhibit, a calligraphy workshop, a sketching session, as well as an introduction to fountain pens for children. 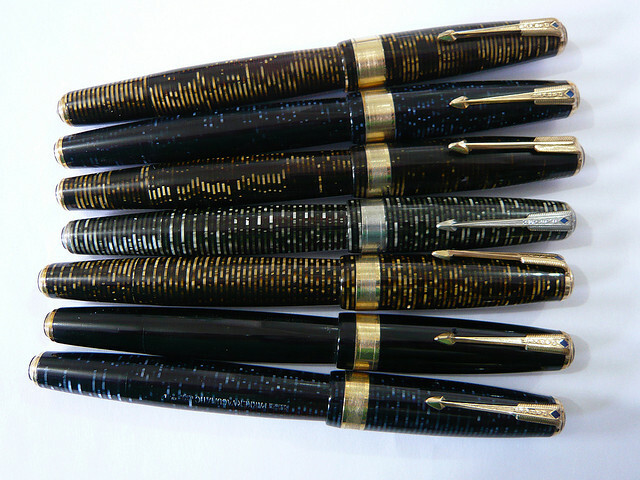 Guests may also avail themselves of services such as vintage pen restoration, appraisals, and nib tuning. For supporting this project, FPN-P would like to thank Manila’s leading purveyors of quality writing instruments such as Everything Calligraphy, Faber‐Castell, Lamy, Parker, Scribe Writing Essentials, Sheaffer and Wahl‐Eversharp/PenGrafik. Our special thanks go as well to Asia Brewery for their assistance. Entrance is free, so take those leaky old pens out of your grandfather’s desk drawer and bring them to us for a cleaning and a good chat. But I warn you: fountain pen use can be highly addictive, and leave your fingers stained in the most wonderful colors. AS IF two trips up to Baguio in early April weren’t enough, I went up a third time later this month. But while my previous sorties had to do with literature—high-minded work, you might say—this third one was purely for fun… and, well, okay, some education of the esoteric kind. That education, I hope, properly qualifies this piece for the Arts & Culture section, particularly as it has to do with my favorite subject of discussion, fountain pens—that’s right, those inky instruments of insistent individuality. 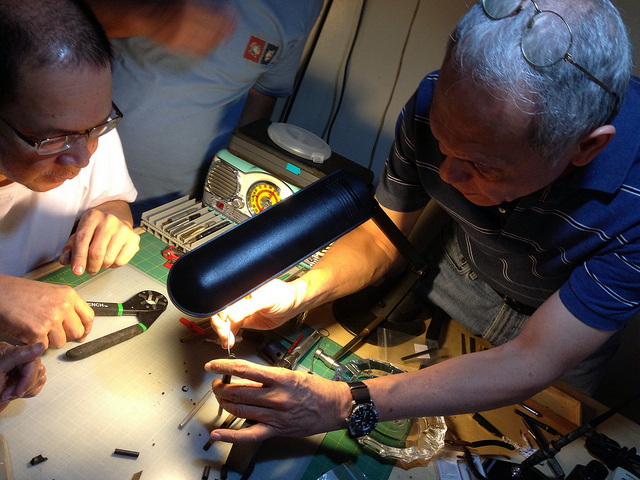 The members of our five-year-old pen club, the Fountain Pen Network-Philippines or FPN-P, had long planned to hold a vintage-pen-repair workshop in Baguio, and this month it finally happened. Why Baguio? Because that’s where our host—the Bali-based Fil-Am pest exterminator (seriously, that’s what he does for a living) Butch Palma—keeps house when he’s in the Philippines, with a veritable pen repair shop and laboratory in the basement. After some hemming and hawing, seven diehards signed up for the workshop: the onetime mechanic, nurse, and now banker JP Reinoso, our local “nibmeister” or master of nib repair and modification; the retired pharmaceuticals executive Chito Limson; the lawyer and DepEd Undersecretary Albert Muyot; the UP engineering major Jonathan Isip, our resident geek and IT specialist; the UP Special Ed grad student Cesar Salazar, who’s had as rich and varied a business background as any; and the two Butches, Dalisay and Palma. Fountain-pen repair is a lot like vintage-car restoration. You want the final product to come out all spiffy and shiny, but there’s a lot of work to do—often insanely complicated work—under the hood. You don’t need just the skills, which no one really teaches; you also need the parts, supplies, and tools, which can be as arcane as they come, such as an inner-cap puller for Parker pens, sac protectors for Sheaffer Touchdowns, lever boxes for hard-rubber Watermans, and rubber sacs and diaphragms of many sizes. These aren’t things you can pick up at True Value; they have to be sourced online, and then painstakingly practiced with, inevitably at the cost of a priceless pen or two. You would’ve thought that—dozens of fixed Vacumatics later—I would be a master at this, and maybe I thought so, too. But at TOB’s workshop, I made another dumb newbie mistake: using a tool I didn’t know without reading or following instructions. The tool in point was TOB’s heat gun, which sends out a blast of hot air like some kind of light saber. I was kidding my tocayo about his having a heat gun instead of a hair dryer because—well, if you see his shiny, saintly pate, you’ll understand why—and then I turned the heat gun on a 1940 Vacumatic that I was going to use to demonstrate my graduate-level skills to the nervous newbies. But, alas, before I could say “This is how…”, the heat gun vaporized a chunk of the pen’s barrel, and there in a smoky wisp went another of George S. Parker’s creations, having survived for over 70 years before some dumb monkey with a PhD zapped it to pen heaven. Boys being boys, and with our precious cargo back in their leather cases, we gathered around the table over scotch and coffee, and babbled into the wee hours about a host of manly subjects: cars and carburetors, terabytes and audio formats, Paul Simon and the Beatles, swords and light sabers, Malcolm Gladwell and Jared Diamond. Now and then some new words and brilliant ideas slipped into the conversation: hadoken, innumeracy, dyscalculia; now and then wives and women were mentioned, but not too often. And every five minutes or so, the talk drifted back to pens, about how gorgeous but oh how expensive the prewar Omas Extra Lucens was, about how Sheaffer Vac-Fills use a bewildering range of rod sizes, and, yes, how quickly vintage celluloid can melt in the wrong hands. Such was our pen boys’ weekend, and—as I’m sure our wives appreciated—there are worse things men can spend their weekends on and weekends with than leaky Vacumatics.